Via Vic from ScreenRant we have this very cool looking new poster for Iron Man, which debuted at Wondercon. Now, this being Wondercon and all one imagines that this poster was primarily done to appeal to a more geek audience, for lack of a better term. So it targets people that are more likely to be aware and interested in the movie, and who are also more likely to care about such details as the type of evolution that the Iron Man armor goes through. Also, an audience more likely to be impressed by the tech aspects of the designs. But I think that the poster would work just fine with a more broad audience too. The trailer for Iron Man has made it clear that this is an origin story, and we have already seen that the armor goes from being a crass thing built in a cave to being the very slick and ultra cool beast people come to know as Iron Man. The poster ties well into that and I think a lot of people will be interested in the evolution the character goes through during the movie, as shown by the evolution of the armor. Probably not the right choice for a main poster (which it isn’t), but a nice addition to the campaign. Wicked poster. 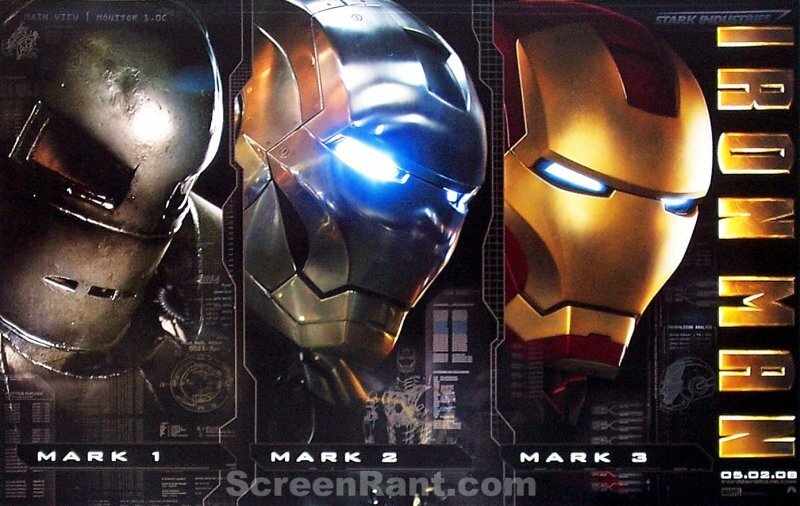 It’s pretty cool that they decided to show the evolution of the Iron Man armor. It’s key to the storyline. Besides, I read that there are even subtle war machine references made in the movie which will be shown to light in hopefully the sequel.